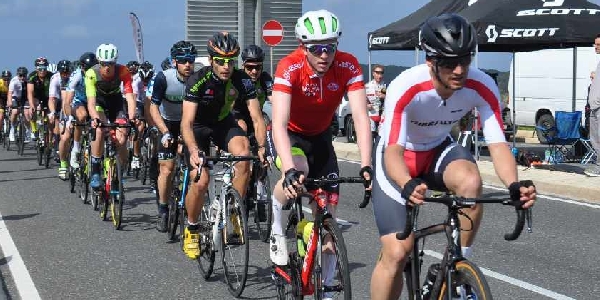 Three local riders are taking part in the tour of Malta and have completed the second stage of the Masters General Classification which included an 83 km course. The 3 riders taking part in the tour of Malta today tackled the second stage. An 83km course characterized by sharp hills and strong wind. As expected, the race was very tactical, with riders looking for a stage win and to improve or hold their position in the general classification. Stacey Rowbottom had a good race in the female’s category and maintained her overall position. Aaron Bagletto's performance also impressed, as he kept the pace with the leaders for the majority of the race only to drop a few seconds behind in the last few laps. Aaron improved his overall position and now stands 15th overall. All eyes were on Derek and former world champion Colin Sturgess in the master’s category as they were the ones to beat. Being the only Team Gib cyclist in the master’s peloton, Derek had to defend himself from the attacks of the other teams on his own. There was no committed attack from the general classification top cyclists and therefore Derek managed to control the situation well and only lost a few seconds in the final sprint. Derek now holds the 3rd position overall, 22 seconds from the 2nd spot and with an advantage of 14 seconds on the 4th athlete. The next stage is the flat 63km course. Unless a break goes off, one would expect this stage to finish in a sprint finish.